1) Employees working in a shop that was recently awarded the Q mark. 2) Employees in a factory which does not give a guarantee with it’s products. A) My name is Maria Ralph, I am an employee at a clothes and shoe shop called ‘suit your boots’. Today we finally were awarded our Q mark. We as the staff at ‘suit your boots’ have been trying to get our Q mark for song long now, nearly 4 months. It’s not that all our clothes and shoes didn’t meet the brief, but most of our clothing items had pieces of strings hanging from them and little rips and no consumer in there right mind would want to buy a jumper with strings hanging from it and holes all up the sleeve. We fixed the issue and now have a section in the shop that visually checks all clothing items before they can be put on stock, we like to call this our screening system. Now we can say that our store has the Q mark and that all our items are now of merchantable quality. B) My name is Maria Ralph and I am an employee at a clothes and shoe shop called ‘suit your boots’. Our store is a very good, hygienic and friendly store. Our store has the Q mark and out products that are sold are of merchantable quality. The boy thing our store doesn’t have is guarantee after a product is bought. A guarantee is a promise from the manufacturer to the consumer which says that if the prospect breaks or has an issue the manufacturer will give a replacement, refund or repair within a certain amount of time. Our stores manufacturer will not give guarantees with our products sold but us as employees would like to change that!. We all signed a petition form to say we would like guarantees to be brought into the shop. We have it to our boss and now we have to wait on word back. We don’t have a guarantees yet so we have lost lots of consumers due to this. Hopefully we will offer guarantees in our store. Maith a bhean! Excellent, clear, creative and well written. You have outlined why the shop was not awarded the Q mark previously to this and how you have taken on the advice offered and repaired the ‘strings and the rips’. You clearly applied your knowledge of guarantees to the question. Great to see the employers listened to the voice of the employees. You must be very persuasive. You have outlined the effects of not having a guarantee in place. Overall tremendous effort and well written. Q.1 My name is Joan I work in a clothes shop called “Simply Styled”. The shop opened 6 months ago and me and all the other employees have been working hard since then to gain the Q mark. Today is the day we have finally got the Q mark, I believe our products standard is finally deserving of the Q mark. Up until now our products have not been of great quality, some of the customer complaints have been of loose threads, holes in the products and faded colouring. We have recently fixed the issue and we now have quality control staff who pay close attention to the quality of our products to make sure they meet “Simply Styled” standards. 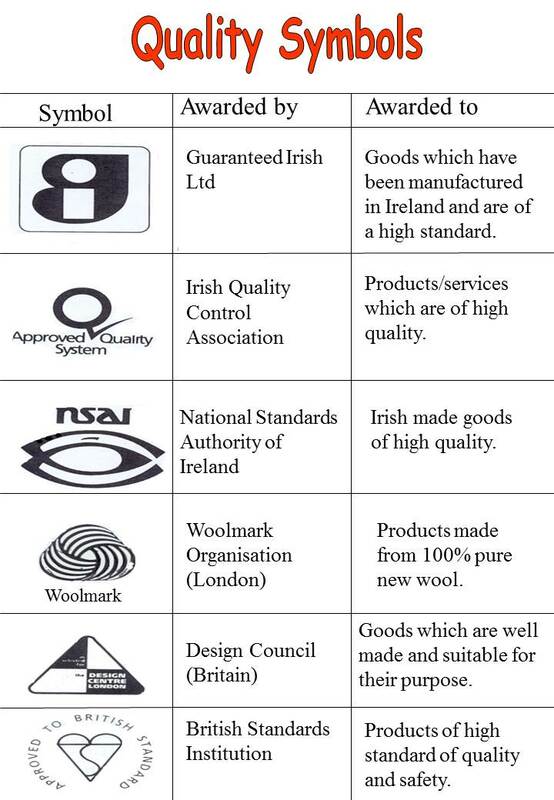 Q.2 My name is Joan, I work in a shop called “Simply Styled” our shop sells clothes that are of great quality and we have recently been awarded the Q mark. There is only one problem with the shop, it does not offer any kind of guarantees on the products sold. As a result of this we get many complaints from consumers who after a few weeks are not satisfied with their product. The shops staff would love if a guarantee was offered with our products as then we could replace, repair or give the unsatisfied customer a refund. We have convinced many of the consumers to write letters of complaint about this and even set up a petition in hopes that the problem can be resolved. 1) My name is Sarah Harding I am an employee of a clothes shop called h&m. Today our shop is being awarded with a Q mark all staff members have been working so hard to get this award. Our shop is a clean friendly shop. If a customer has a problem with clothes we get to the problem and fix it as we don’t want any customer regretting our services. We check all stock before putting it on the floor we our proud to say we have the Q mark and pur items are at merchantable quality.